PARKLAND, Fla. (AP) — Students at more than 1,000 schools across the country are registering young voters in lunchrooms, hallways and even at upcoming graduation ceremonies in a week of activism aimed at electing lawmakers who support gun reforms in response to school shootings in Florida and Texas. David Hogg, a senior at Marjory Stoneman Douglas High School in Parkland, is spearheading the national effort along with the New York-based organization HeadCount. Hogg and organization officials say students at more than 1,000 schools in 46 states are participating, with most starting their drives Tuesday. Their goal is to have 90 percent of the nation’s high schools host drives before the current senior class graduates in hopes of boosting young-voter turnout, which is traditionally low, especially during midterm elections. “We need to vote people out of office that are perpetuating issues affecting young people like gun violence. ... The youth don’t vote lawmakers into office and as a result they don’t work for them,” he said. Student organizers are trying to reach teens in spots they frequent, including coffee shops and at school assemblies, where they say it takes less than two minutes to register them. 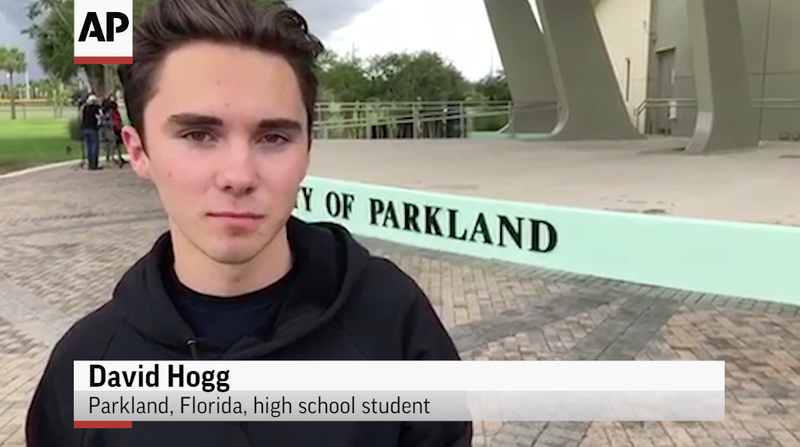 There was little activity at the voting booth at Douglas High School on Tuesday because the majority of eligible students have already registered, Hogg said. The students have held three other voter drives in the months after the Valentine’s Day shooting that claimed 17 lives. Roughly 43 percent of 18-year-olds in the United States were registered to vote in 2016, but only 34 percent voted in that year’s presidential election, HeadCount representatives say, citing statistics from the U.S. Census Bureau. Turnout for congressional and local elections is even lower. “It was kind of shocking to me, and the fact that this has happened time and time again in this country and nothing’s changed. There’s been no stronger gun-control laws passed,” she said. Nurah planned to hold a voter-registration drive in her school’s cafeteria on May 17, but school administrators said it was too close to the end of the year. She helped about 33 young people register in her town square, more than half of whom were under the age of 25. Grace Goldstein, a 16-year-old sophomore at Stuyvesant High School in New York City, saw Hogg’s tweet about hosting the drives and immediately responded. She said she felt an instant connection with the Parkland teens: She was locked down inside her school on Halloween of 2017 when a terrorist drove a pickup truck down a crowded bike path along the Hudson River in Manhattan, killing eight people and injuring 11 before being shot by police. Goldstein formed the activist group Stuyvesant Says Enough, which has organized walkouts and rallies that have for the most part gotten a strong response from students. Still, she worries “that student apathy is a very, very dangerous thing” and something she’s already observing as school shootings fade from news headlines.